If you watch between midnight and dawn on Friday, October 21, or Saturday, October 22, 2011, you should see some meteors in the Orionid meteor shower. Meteors are fancifully called shooting stars. They aren’t really stars. They’re space debris burning up in the Earth’s atmosphere. The Orionid meteors are debris left behind in the orbit of Comet Halley. The Orionids can best be described as a junior version of the famous Perseid meteor shower. The meteors are known as “Orionids” because the fireballs seem to fan out from a region to the north of Orion’s second brightest star, ruddy Betelgeuse.The Orionids typically produce around 20 to 25 meteors per hour under a clear, dark sky. 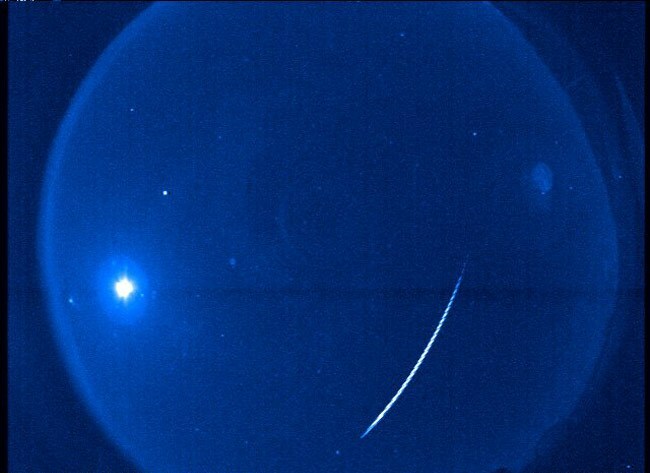 Orionid meteors are normally dim and not well seen from urban locations. Orionid meteors will begin to increase noticeably around October 17, when they’ll start appearing at about five per hour. After peaking on the morning of October 22, activity will begin to slowly descend, dropping back to around five per hour around October 26. The last stragglers usually appear sometime in early to mid November.